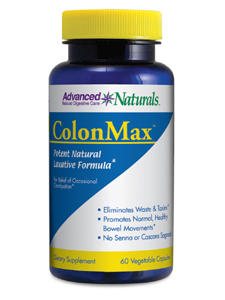 Dietary Supplement - Eliminates Waste & Toxins - Promotes Normal, Healthy Bowel Movements - No Senna or Cascara Sagrada ColonMax™ Easy-to-swallow capsules contain natural ingredients for relief of occasional constipation. Contains no yeast, wheat, corn, soy, gluten, salt, sugar, dairy products, animal products, binders, fillers or artificial ingredients. Manufactured in a GMP and Kosher facility. Directions: Take 2 capsules at night. May start with 1 capsule the first night then increase to 2 capsules if needed. Supplement Facts Serving Size: 2 Capsules Servings per Container: 30 Amount per Serving Magnesium (as magnesium hydroxide) 230 mg Proprietary Blend 1,200 mg Cape Aloe leaf (Aloe ferox) Rhubarb root (Rheum officinalis) Slippery Elm bark (Ulmus rubra) Marshmallow root (Althaea officinalis) Triphala (blend of Amalaki, Bibhitaki and Haritaki) Other Ingredients: Vegetable capsule (vegetable fiber and water) WARNING: Do not use this product if you are pregnant or nursing. Consult your physician before taking this or any product if you are trying to conceive, have frequent diarrhea, are taking medication or have a medical condition. Not for prolonged use. Do not exceed recommended dose. Notice: This product contains rhubarb and cape aloe. DO NOT USE IF YOU HAVE OR DEVELOP ABDOMINAL PAIN, DIARRHEA OR LOOSE STOOLS. Please read and follow directions carefully.